Ending the weekend with a stocked fridge + a warm Zoodle Bowl with Roasted Veggies and Tahini Sauce. Coming off of Thanksgiving last week, I didn’t do any meal prep and to be honest, I felt it by the end of the week. So today I roasted lots veggies, whipped up our favorite Tahini Sauce and my husband grilled chicken so we’d have some healthy options at the ready. This vibrant and savory bowl of goodness is what my plate looked like. The details… Warm Garlicky Zucchini Noodles tossed sesame seeds, Spiced & Roasted Butternut Squash, Roasted Brussel Sprouts, Roasted Turmeric Cauliflower, 1/2 an avocado topped with hemp seeds and the yummiest Tahini Sauce. Fresh, nourishing and delicious! Naturally gluten-free and plant-based, this vibrant and savory bowl of veggies is nourishing and delicious. 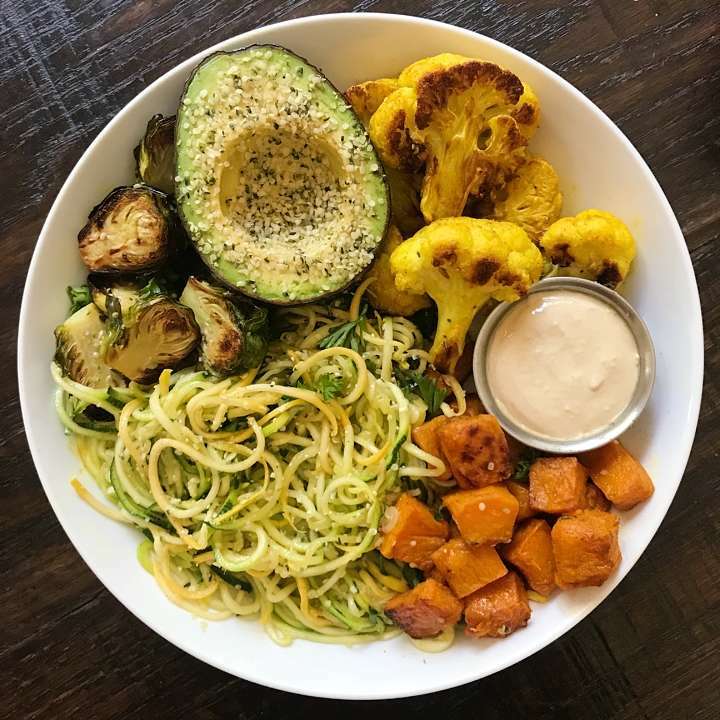 Warm zucchini noodles and warm roasted vegetables with the yummiest tahini sauce. Feel free to add protein of choice. Roasted veggies can be made ahead, stored in the refrigerator in sealed containers and served room temperature or heated up. I find the best way to heat up roasted veggies in in a skillet. Alternatively you can heat them up in the oven. Zoodles are best made fresh or heated up a the skillet. In a large bowl add oil, cumin, paprika, and sea salt and mix to combine. Add Butternut Squash and toss to cover in oil-spice mixture. Arrange in a single layer on baking sheet. Bake 20 minutes. Turn squash over. Bake an additional 15 minutes or until tender. For more crispy squash, bake a bit longer. Set aside. In a medium bowl, mix a 1-2 tablespoons of oil with the turmeric until well combined. Add cauliflower florets and toss to cover cauliflower with the turmeric-oil mixture. Add more oil and turmeric as needed or desired to coat all the cauliflower. Heat olive oil in a medium sauce pan over medium heat. When olive oil hot and shimmering (not smoking), add garlic, stir for about 30 seconds until fragrant. Add zucchini noodles. Saute stirring frequently until Zucchini noodles are tender crisp, approximately 5- 7minutes. (Adjust cooking time if your noodles are thicker or thinner). Season with salt and pepper to taste. Stir in sesame seeds. Place all ingredients except the water in a food processor or small blender. Add ¼ cup water and process until smooth, about 1 minute. Scrape down the sides as needed and add more water, ¼ cup at a time to get desired consistency. The amount of water may depend on the consistency of your tahini. I tend to end up using ¾ cup water to get the consistency I prefer. Taste and adjust as desired adding more lemon juice or salt as desired.